I love family stories. My own family's included. When my maternal grandparents were alive, I loved listening to them talk about the past. After they were gone, I found quite a few treasures among the old photographs and letters my grandmother had held onto during her life time. I wanted to know everything about them, about my family. As an extension, I am quite fond of novels where a character delves into her own family history, whether it be uncovering a long held family secret or finding strength in the past by those who came before--often both. 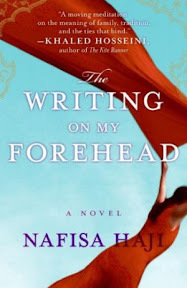 The Writing on My Forehead by Nafisa Haji is one such novel. Framed around her own story, protagonist Saira reaches into her memories for answers to help her through a very difficult and tragic time in her life. Alongside the present day story is a coming of age story as Saira sets out on her chosen path. Bucking tradition, family and faith, she refuses to marry and pursues a career in journalism. And yet it is that very tradition, family and faith that will be there for her in the end. I liked Saira. She is intelligent and curious about the world around her, unafraid to ask questions. Raised in the United States, she is faced with a culture that values individuality and another, her family's, that is more centered around family and tradition. I was reminded of Jhumpa Lahiri's The Namesake, which also touched on this topic. I really appreciated how the author handled the cultural aspects of the novel. Although Saira may have chosen an unconventional path, characters like her sister, Ameena who was more traditional, were not painted in a negative light. Both lifestyles were portrayed realistically--having negative as well as positive aspects. One of the most interesting characters was Mohsin, Saira's cousin. He had discovered their grandfather's journal in a trunk in the attic and shared the grandfather's story with Saira. Roshan Qadar had been an activist, fighting for the betterment of the Indian people. Mohsin hoped to follow in his footsteps. Mohsin, her grandfather and the example of her favorite aunt are what shaped Saira's choices in life. My only disappointment is that more time wasn't spent on Mohsin's story, especially given the important role he played in Saira's life once she became a journalist. That favorite aunt of Saira's was a favorite character of mine as well. Big Nanima, as Saira called her, is a professor in Pakistan. She had never married, not so much by choice but by circumstance. She had studied in England and was a great inspiration for Saira. Even while she encouraged Saira to make her own choices in life, she also asked her to remember her family and not be so quick to toss away the traditions the family held so dear. I thoroughly enjoyed The Writing on My Forehead. There is so much that we can learn from the stories of our families. While Saira's own story at times seemed secondary to the stories of her family members, it is a rich novel; while at times tragic, it is also full of redemption and heart. You can learn more about Nafisa Haji and her book on the author's website. Be sure and check the TLC Book Tours website as well. Thursday, March 11th: My Books. My Life. Wednesday, March 31st: Book Club Classics! The writing is just beautiful too! I become so sad when I think about all the stories I DIDN'T get from my grandparents before they died. My cousin had my grandmother fill out a book of questions and prompts before she got Alzheimers. It was amazing to read the things we never knew. This sounds like a really great read. Thanks for sharing your thoughts on this one as you've definitely msde me want to pick it up! This sounds like one I will add to my TBR pile. I studied history in college and can't resist books that delve into family histories! I love family stories too. I also love stories about cultures and traditions different from my own, so I think there's no way this wouldn't be a win for me. Lovely review and it has made me want to read this one!! Great review, Wendy! I too love reading family stories. This book sounds like a winner so I'll have to check it out. I'm also on the tour for this one and am looking forward to it. Hannah - Thank you, Hannah. I agree with you about just how much we can learn about ourselves through our families' histories. Sandy - Yes, the writing was beautiful, wasn't it? I wish I could know more about my paternal grandparents than I do. Those books, like the one you mention your cousin having your grandmother fill out, are such a great idea. I imagine some people might see them as a headache, but it's such a treasure, especially from our perspective as the grand children. Aarti - I understand what you mean. Too much of a topic does get old after awhile. I haven't yet grown weary of books like this. The extent to which this book was about her family's histories made it less about the cultural differents though--that was just an aspect I picked up on more because it interests me. I was especially curious about the Indo-Pakistan connection as it seems most of the books I read about the Indian culture tend to be more India and Hindu related. Samantha - I really enjoyed this one and hope you do get a chance to read it! Kathleen - I sometimes think I should go back to school and study history. It was one of my favorite subjects in school--that and literature. And yet, I didn't focus on either subject in school or go into fields related to either subject. Go figure. Nymeth - I felt that way too! A book about family history and about cultures and traditions is sure to appeal to me. I can't resist them for long. Staci - Thank you, Staci. I hope you do get a chance to read it. Melody - Thanks, Melody! I think you'd really like this one. Serena - I look forward to reading your review of it, Serena! It sounds interesting...thanks for a great review (as usual). And I notice it got a cover blurb from Khaled Hossieni. I love your review. It's been a while since I read this as an ARC, but your review took me back. I really enjoyed this book so much. Wendy...terrific review. I like these kinds of stories and plan to read it this weekend for next week's tour. Thanks for your thoughts. Wendy, we are kindred spirits on loving family stories! I'm always asking my grandma questions, and one of the things I treasure most is a photo album she gave me with a lot of really old pictures. Sounds good - I love a great family story too! From the passage you posted, it looks like a beautifully written book. Thanks for the review! Christine - I am glad you enjoyed it too, Christine. I don't know how I missed this one the first time around. Diane - Thank you. I can't wait to read your thoughts on this one later this week! Kathy - I hope you get a chance to read this one. Anna - Oh, it is! I really liked the author's writing style. Kristen - I hope you will enjoy it as much as I did! I love family history, epecially my own, as well. I have one grandmother living and she loves to talk about her childhood. I don't even care when I've heard the same stories a dozen times.